Ignore the naysayers prophesising the end of beards. What do they know? Beards are still cool, believe us. But the trends for 2018 do have hairy chins in their sights. The hirsute harbinger of manly maleness, the lumberjack will find his freedoms reined in somewhat as fashions swing round to a new architecture in facial hair. Full unruly beardies will give way to more structured shapes, fades starting from the cheekbone, tapering from the ear to the end. But that doesn’t mean they’ll be shorter. If you want to be in with a fighting chance of beard brilliance, look to boxing front man Conor McGregor. Finish off with some American Crew Beard Serum to nourish, regenerate and protect, all necessary to ensure a smooth, silky feel. On the other end of the spectrum, there will be stubble fun with two trends fighting it out neck and neck. First up is the glorious stubble and ’tache combo that lets the less hirsute – those who can champion a moustache but struggle with chin hair density – play with the beard gang. The stubble makes sporting a moustache, which is still a tricky look to carry off, easier, while the ’tache beefs up the chin wear. It’s the new hipster vibe. In the other corner is baby stubble, where strategically situated patches of stubble are left, usually around the chin and upper lip, hinting at youthfulness where you aren’t quite old enough for a beard yet; great for those going for the boyish look or with enviously good bone structure. But don’t let it get too long or it may fail the bum-fluff test. All three trends incorporate the architectural approach to beard care and benefit from regular tapering and trims. 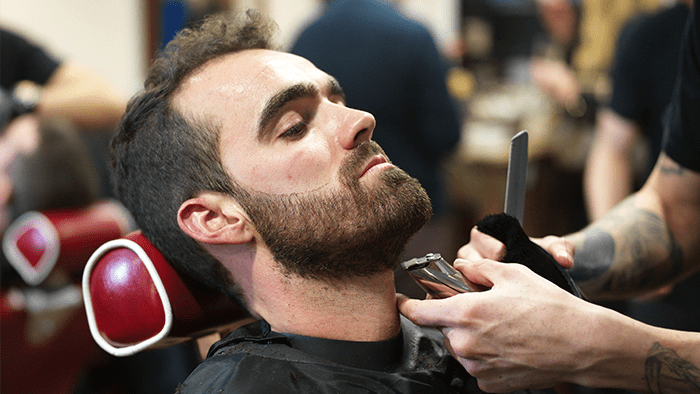 But to really achieve a polished finish all trims should include cheek threading to remove those arrant hairs above the beard line that will undermine the slick, sharp feel. Ask your Jacks barber for a demonstration.